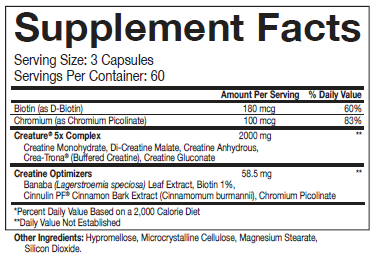 As a dietary supplement, take 3 capsules 30 minutes prior to workout and again 30 min. after workout. On non-workout days take 3 capsules in the morning and again in the evening. Allergen Warning: This product was produced in a facility that may also process ingredients containing milk, eggs, soybeans, shellfish, fish, tree nuts, and peanuts. Storage Conditions: Store in a cool dry place. Warning Check with qualified healthcare professional before using this product, or any dietary supplement, if you are under the age of 18 or if you have any known or suspected medical condition(s) and/or are taking any prescriptions or OTC medication(s). Do not use if bag is broken or appears to have been tampered with. KEEP OUT OF THE REACH OF CHILDREN.